Win Diego’s Night Life; In a 12” x 36” panoramic print. The nighttime image of Downtown San Diego features the 2012 Supermoon and is printed on Fuji Pearl. Fuji pearl is a metallic photo paper that gives a unique glow to photographic prints. The image was artistically created to highlight the colorful reflections off the bay’s dark water. The fine colorful detail in the printed image will be a great Fine Art piece to hang in any home or office. “Diego’s Night Life” is valued at $150 and here is how you can win it! An extra bonus entry can be earned if you correctly answer how many American flags can be spotted in this image. Leave your answer in a comment below. Bonus entry guess ends 6/22/12. Contest ends June 30th 12AM. Winner will be announced no later than 1 week after the contest ends. 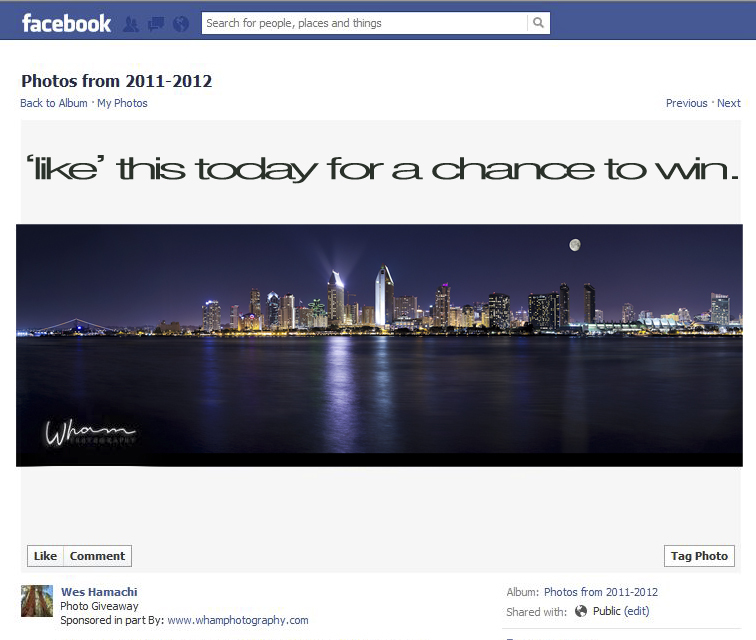 Winner will be announced on this post, and notified via FB message. Winner will be responsible for shipping charges outside the continental U.S.
Names with ‘2’ have two drawing entries.